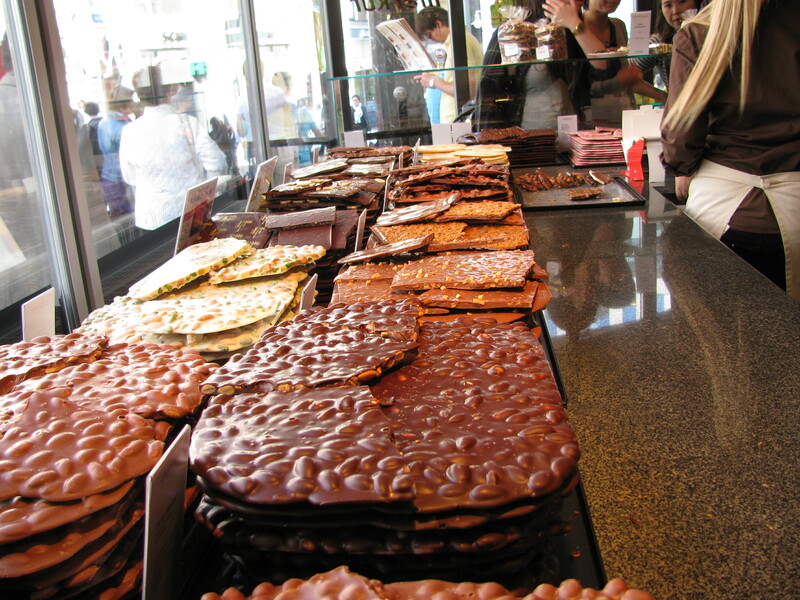 You can never have too much Nutella. 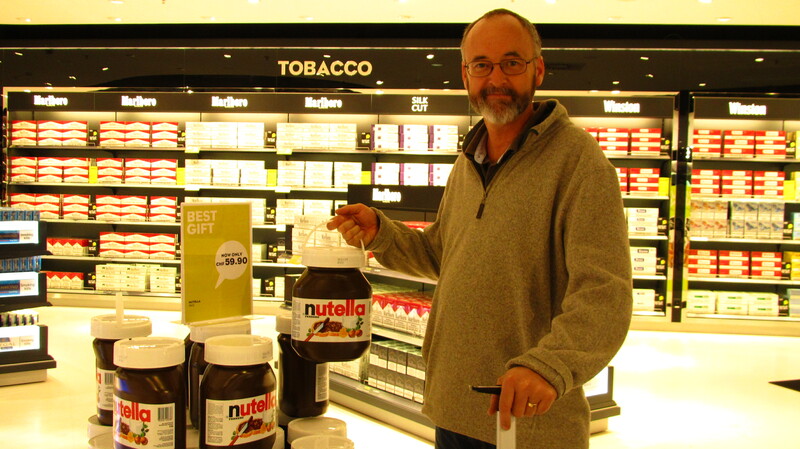 Note: Dave is only admiring, not thieving, this bin of Nutella we found at Zurich's airport shops. When overseas, I live in fear of several things. One of them is being arrested for shoplifting. I don’t shoplift, not since I pinched a package of gum from a Pembina Highway drugstore in Winnipeg circa 1966. My father caught me and that was my last foray into criminal life. But I have a guilty visage. Maybe it comes from being raised Catholic, or from belonging to a genetic group fair of hair and skin with a highly responsive endocrine system that means I blush deeply and quickly. This bites more than one would think. I count it as the cause for many troubles. For example, when Jim Chambers spent our eighth grade year at Acadia Junior High whacking me on the head whenever teachers were not looking, if my surprised cry at being blitzed drew the teacher’s attention, it was me who was sent to the principal’s office. There I was subjected to lengthy waits and grueling interrogation sessions with principal Mr. R.D. Biggs slapping the proverbial strap threateningly against his palm while trying to get me to confess that I had hit Jim, and not the other way around. As a side note: Having an authority figure trying to force a false confession out of me was worse than the slugs I took to the cranium. It was all because I broke out into a crimson blush while Jim looked away as though he did not notice me nearly passing out from the latest blow. The teacher, taking in this evidence, assumed I was the abuser. Yes, their names are Jim Chambers and R.D. Biggs, and if they by the slimmest of chances read this, my message to them is: Yes, I remember your names. Oddly, I had similar experiences in adult workplaces. Perhaps public school really does prepare a person for the rigours of the job market. So, I look guilty, almost always. This is inconvenient in Canada or other English-speaking countries, but downright discomforting in a place where I don’t speak the language, so when I notice a store undercover patrol tailing me as I troll through the local shops, I get nervous, and when I get nervous, I blush, and then, because I am also a menopausal woman in the season of hot flashes, I start to sweat. If they cuffed me and dragged me into a tiny backroom, I would not be the least surprised. I still would not confess though. Good luck with that, I say to store security personnel. There is nothing like the fear of false accusation or imprisonment to spark new solutions to old problems, and I have discovered one. This week, as a female security staffer in plainclothes followed me over two floors at Biel’s Loeb store, I did something I have noticed also sent Victoria and Saanich Police’s undercover cops* hightailing away from me. I started following the security patrol. Nothing upsets the universe’s natural balance like tailing a tailer. The officer quickly moved to another part of the store, but still within sight. I followed, and soon was flipping through the same rack of dresses as her. Her discomfort increased and she shuffled away. I drifted after her, as if I were the store patrol. Her cheeks reddened and did I detect sweat on her brow? She looked guilty as heck. I would have arrested her, but then, I was playing, she was not, so I let her off with a warning glare. * The Victoria Police and Saanich Police undercover incidents occurred while I was working as a reporter. They were not following me, but they were following/surveying people I was following/interviewing. ** Jim’s reign of terror ended when I finally figured out that I was going to get sent to the principal’s office no matter what, so the last time he hit me in the back of head with a textbook, I punched him in the face until his braces flew out. Appeasement, reason, avoidance, bargaining – nothing worked with that bully like a solid hook to the jaw. I’m sorry peace-advocates, but sometimes that is the only way. Wow giant sized Nutella mmmmmmm. What else do I have to do but conduct these little social-behavior experiments? Just for clarity, I was NOT stealing that Nutella bottle. I was there. He was not stealing it – just admiring it. Nutella in bins is a dream come true for Hatherly men.